An HIV-positive advocate reminds us about the need for mental health services. Everyone knows that wearing a red ribbon is a sign of support for people living with HIV, and millions around the globe come together every year to raise awareness about the disease on World AIDS Day, December 1. Less well-known is the green ribbon, which supports people living with mental illness, and has its own observance each May, which is Mental Health Month. Both celebrations raise awareness, help to combat stigma, and raise funds for the populations they honor. Whether you attribute it to my brain chemistry or my Italian heritage, both the red and the green colors of the ribbons and the Italian flag apply to me. My story begins in 1996, when I lost my mom to breast cancer and shortly thereafter was diagnosed with HIV, and then with bipolar disorder. I went through a very dark time—add substance use to the list of challenges—but managed to climb out of the abyss. I put myself on the road to recovery by seeking therapy, finding the right medications, and serving as an advocate and support to others going through similar experiences. In the process, I realized that I am not alone. Researchers estimate that as many as 40 to 60 percent of the HIV-positive population will experience depression at some point. That’s right—half. Another study looked at 200 adults living with HIV and found that 15 percent had bipolar disorder. And whether you are HIV positive, have a mental illness or both, it’s quite likely you have a substance use problem as well; data shows that if you have a mental illness, your chance of having a substance use disorder also is as high as 50 percent. Any one of these issues can be incredibly difficult to manage—now imagine having two of them, or worse, all three. Talk about stigma. Sadly, though, services for these disorders are often siloed. Many providers treat one or the other, but rarely do you see a brochure about mental health treatment in the waiting room where you get your HIV meds, or vice versa. 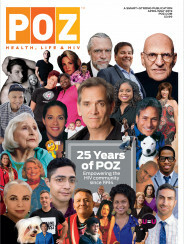 There are bright spots, such as Positive Impact in Atlanta, a nonprofit organization that recently celebrated 20 years in fighting HIV by promoting mental health. Callen-Lorde Community Health Center, in New York City’s Chelsea neighborhood, recently received full licensing and now offers long-term mental health services for their HIV clients; the demand is so high, there’s already a wait list to get in. But when have you seen an AIDS and mental health ride, or an AIDS and mental health walk? When these disorders pile up, it can be incredibly isolating—and failing to address them together makes that road to recovery a long one that is oftentimes rocky. But it is a road that can inspire others. This year is special for me, as I was named a Voice Awards Fellow by the federal Substance Abuse and Mental Health Services Administration (SAMHSA). I am spending 2013 telling my story and spreading the message that if you face one or more of these struggles, you are not alone. If you have HIV and find yourself depressed, don’t wait—talk to your health care provider so you can get the help you need. Visit my site at bipolarbear.us and check out the resources I’ve compiled to help. You have to be just as proactive about your mental health treatment as you are in caring for your HIV. Last, look for the courage to tell your story, whenever you can. The more we talk about the fact that HIV, mental illness, and substance use co-occur, the better the chance that service providers will ask the right questions and offer the right treatment. Hopefully we can chip away at the stigma that piles up as well. This May, you can help—by wearing a green ribbon and a red one too, side by side. 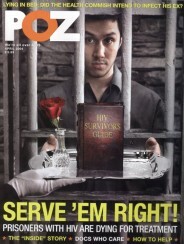 Stephen Puibello is an HIV/AIDS and mental health advocate. Go to bipolarbear.us for more information.